Xie means to write and Yi the meaning. A famous Master of Chinese painting, Zhang Daqian, said that Xieyi indicated the fact of drawing the spirit of the beings. 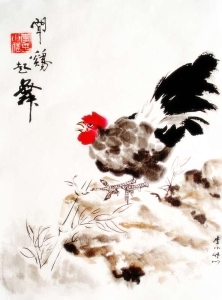 Painting Xieyi uses many techniques of calligraphy which privilege the spontaneity of the line. Paintings Xieyi are thus very quickly carried out but it needs a very long experience. Painting Xieyi is practised on absorbing paper XuanZhi. The large brush LangHao whose rigidity of the hairs makes it possible to paint the branches and the rocks. The brush JianHao which, combining force and flexibility, is useful in the representation of the bamboos and the orchids. The large brush YangHao whose flexibility makes it possible to carry out full movements and beautiful shade. In general, we trace a draft with the pencil on another sheet. Then, painting is carried out, which takes a few minutes at most. The brush must always be wet. You can use ink or colour, soaked on the brush according to a principle of shade: darkest with the point and more clearly towards the base of the hairs. The layout is made in only one movement. Obtaining the shades depends on the pressure and the slope of the brush.